Our tomatoes have only just begun to ripen here, so close to the cool of Lake Michigan. The first ones are always the most exciting to see. Yesterday I plucked a half-dozen cherry tomatoes and two very small, red Early Girls. We had also gone grocery shopping the day before, which included picking up a jar of mayonnaise and a carton of ricotta cheese (for stuffing cattail ravioli I'm planning on making today or tomorrow). So, with a handful of small tomatoes on the counter and restocked mayo and ricotta in the fridge, I thought a veg tart might be a good way to make use of our garden's gifts. 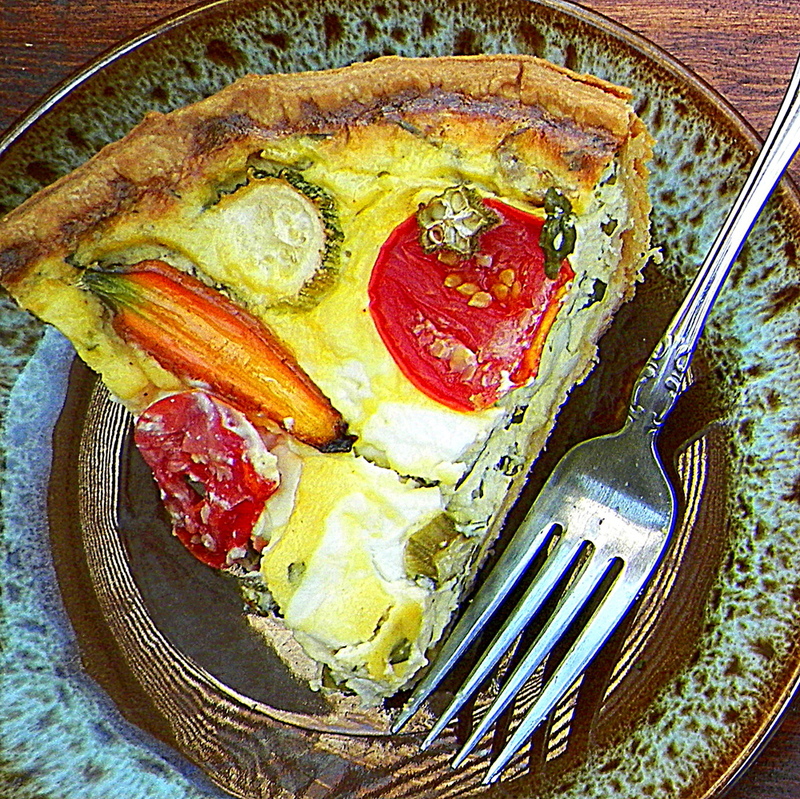 The differences between a quiche, a frittata and a tart are subtle. They're all basically the same thing, but with a few small variations. A quiche and a frittata are both primarily egg dishes, but a quiche also often includes cream or milk, has a bottom crust and is baked in an oven, while a frittata is an eggs and filler ingredients (e.g., veg) dish, no crust, cooked on a stove-top to start and finished in the oven. A tart is often a creamier, custard-like pie, heavy on ingredients like cheese and mayo and lighter on eggs, much shallower in height, and usually baked in a pan called...yes, a tart pan. It's been quite a while since I've made a tart. In fact, I no longer even have my tart pan; I think I lost it or tossed it years ago. I'm really a frittata and quiche kind of guy, as I generally prefer my egg pies to be tall, savory and weighty. But for whatever reason, this morning felt like a tart kind of morning. This recipe will give you enough to make a couple 9" tarts, with enough dough left over, if you roll it thinly, to make crust for a couple of small pot pies (those are on tonight's menu). 1) In a shallow mixing bowl, mix a teaspoon of salt into the flour. Add the butter pats (make sure they're cold and firm) to the flour and start working it in until you get a nice, crumb-like consistency. It'll take a while, and you could use a mixer if you so desire, but I like to use my hands. 2) Once you get a fine, crumby mixture, add the cold water (ice cold water...yeah, put a couple ice cubes in it to make sure it's cold) and mix until you get a solid, firm ball of dough. If you need to add a bit more water add it only a teaspoon or two at a time. You want the dough to be firm. And use the dough ball to pick up any bits sticking to the bottom or sides of the bowl. 3) Wrap the dough in plastic wrap, flatten it a bit, and place it in the fridge while you work on the filling. It should stay in the fridge for at least on hour, but you could also make the dough a day or two ahead of time if you're planning to make the tart later on. 4) After the dough has had time to think about its behavior, pull it out and place it on a lightly floured surface, flour the top and roll it out to no more than 1/8" thick (I go less than that even, as the dough will puff a bit when it's baked). Cut it to fit your pie or tart pan and press it in up to the sides. Place the pan back in the fridge for 10 or 15 minutes. Turn your oven to 350°. 5) Take the pan (or pans if you've made more than one) out of the fridge and pepper the dough with little holes from a fork. Place a piece of foil, large enough to cover the crust, gently in the pan and fill it with dried beans to weight it down. This will help prevent the dough from puffing up in spots, keeping a uniform crust throughout. Bake on the bottom rack for about 15 minutes, until the edges appear as though they're beginning to brown. Remove the pan from the oven, remove the foil and beans (let the beans cool and return them to their container for future use or eating). Place the pan back in the oven and bake for another 15 minutes or so, until the crust is a golden brown. 1) Mix the mayonnaise, ricotta, salt, pepper, cayenne, garlic, eggs, and chopped basil in a bowl. 2) Cut the veg into small or thin pieces. 3) Pour the cheese and egg mixture into the crust-lined pan, only filling it about half-way. Add the veg and pour more of the cheese and egg mix in to fill. Top with pieces of goat cheese (or parmigiano-reggiano). 4) Bake on the middle rack at 350° until the top starts to brown a bit and you gather that the interior has cooked and firmed up. Cut pieces for you and your partner, pour a couple of mugs of good coffee (something like Anodyne Roasting's Ethiopian Yirgacheffe...awesomely delicious), and watch your ducks tool around the yard (you do have ducks, right? ).